One of the first specialised Meccano parts, the propeller blades can't be used for much other than their obvious application. The early propeller blades can be straightened and used in other areas, but the formed shape of the later type of blades is pretty much fixed. EMP ignores the pea-red single-hole part 41, and mentions a two-hole nickel part from 1923. These were probably to special order only. The early blades were introduced in 1909, in outfits 5 and 6 (the largest at the time). In 1926, they were painted pea-red (along with the "New Meccano" parts), and in 1927 gained a second hole and changed to dark red. The second and much more common design of part 41 remained all the way through UK production, although later versions are rare as they were dropped from outfits in 1954 (previously they had been supplied in both outfits 9 and 10). Light red and later varieties were therefore only supplied as spare parts, but no manual models used them and therefore they would have rarely been needed. The first of the type 2 shaped blades (in dark red) are found both left- and right-handed. I believe it can be assumed that the unusual left-handed versions came first, and the much more common right-hand variety soon replaced it and continued through all other colour schemes. Of course, even after the advent of dark red/green Meccano one could still order nickel-plated parts from the Meccano factory. The propeller blade is one of those parts that changed just after the start of coloured Meccano, so the type 2 blade in nickel (type .ni2 below) would only have been available by special order and as such is a very rare part. The type 1 blade with two holes in nickel finish (normally only available in dark red) also exists, but to special order only. The Yellow #41 with the black tip was introduced first and changed to black with yellow tip when someone (a member of the public, it is thought) pointed out yellow tip blades were standard aircraft practice at that time. 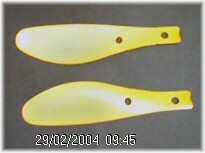 Apart from the left-handed and right-handed varieties, one obviously strange combination is this pair of all-yellow blades (apologies for the unclear picture). These appear to be late 60's yellow blades that should have had a black tip, but have been 'freed' from Binns Road before they had their second paint colour added. To the left in the photo above, post-war medium red/green propeller blades in brown paper. To the right, the light green label on the yellow box identifies the parts as being light red/green, from 1958 to 1963. After the blades were dropped from all outfits, blades such as these light red ones with a light green tip would only have been available as spare parts. I was just sorting through some of my meccano, when I spotted I had a left hand blade, so came here to check, on closer inspection though I seem to have a variant not mentioned here, its nickel/ bare metal with a green tip, right hand with 2 holes - later shape. I was cleaning up some old propeller blades for re-painting and found that the mid-red with green tip blades have a line scribed on both sides marking the boundary of the green paint. Only obvious with the paint removed. A line to guide the girl painting the tips? I have four of the early shape of propeller blade, all in Nickel and all with two holes. All four are different, in that one is unstamped, one is stamped "Meccano" (only) and the other two are stamped "Meccano fabrique en Angleterre" but with the stamping reversed relative to each other. I will send you photos in case you wish to include them on this page. I have four unused part No 41 which are light red with medium green tips in the original dealers yellow box. Does anyone know anything about these. Maybe there they from the colour change over period of 1957?